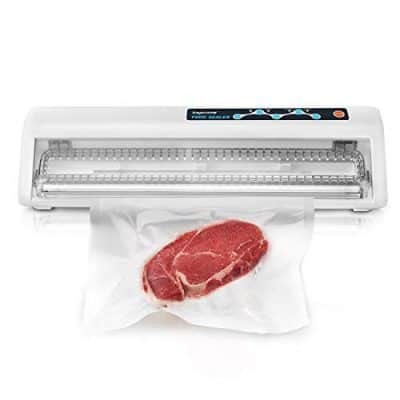 The Toprime VS6620 Vacuum Sealer is one of the many compact value priced low quality vacuum sealers that has come on the market as a result of Sous Vide Cooking becoming more popular. We think the NutriChef PKVS18SL is a much better value, but if you need something lower in price look at the Aobosi Vacuum Sealer. The quality is slightly higher for about the same price. Transparent cover on sealing chamber. No on-board bag roll storage. 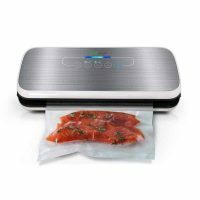 The Toprime Vacuum Sealer is a lower quality vacuum sealer, that should really only be considered by someone who is going to use a vacuum sealer very infrequently. We strongly recommend the NutriChef PKVS18SL instead. This model is fairly simple to operate you place the bag over the sealer bar, close the lid so you hear a click on both sides, and then press the seal or vacuum seal button. The one nice thing is see-through window making it easier to correctly position your vacuum seal bag. The quality on this model is really questionable, it does come with a 1 year warranty, but good luck contacting them, they don't have a website or office location listed anywhere on the internet. Has settings for different food modes. Has accessory hose allowing you more flexibility with sealing other types of food storage containers. 15" x 5" x 3" 6" x 14" x 3" 15"x 7"x 3"
The Toprime Vacuum Sealer is a low quality product that we recommend you avoid, instead look at the NutriChef PKVS18SL.